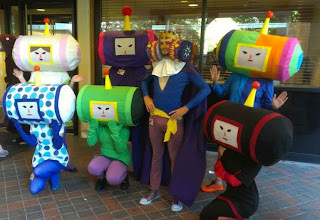 While my Jareth costume did not happen even remotely, here are the results for both Kurama costumes and our Katamari cosplay. 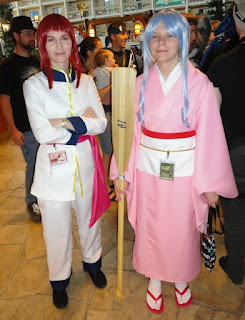 The girl standing next to me is cosplaying as Botan from the same anime. 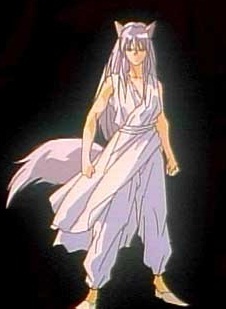 Thoughts: I love this outfit of Shuiichi Kurama's. Almost no one knew who I was because Shuiichi Kurama has two, arguably three, more popular outfits. I have never seen anyone else wear this particular outfit. Even doing a Google search turned up no others like this Also, the wig was awful! I couldn't get it right, so I just did the best with what I had. If I ever bring back this outfit I will commission a new wig. The one I made (sadly) belongs in the trash. I had to hot glue parts of it, which means it cannot be taken out and re-done better. The hot glue happened because I was running out of time and options. I don't really recommend hot gluing your wigs. Thoughts: This one was much more of a hit. My one main problem was the ears slipped if I looked down. Otherwise I liked it very much. Notes on making our costumes: We made the cardboard frames and wrapped those in quilt batting. I believe that we all used some interfacing (I did because mine is white and I didn't want everyone to see through the cloth and such) and sewed the cloth like a pillow case which could be slipped on. Due to the irregular shape, they had to be hand sewn shut. I left a hole for my head to go through, but my friends, being wiser, did not and cut it afterwards (which made the case fit better). The linings around faces and edges are hemmed and hot glued on. The cones and balls for the antennae are foam. The cones are covered in yellow cloth and the balls are painted and we hot glued them on last. The faces were made with a cross-stitch mesh covered with two layers of a chiffon dyed a flesh color. The eyes, noses, and mouths are felt that we did together for consistency and are hot glued on. For my dress I used a pattern made for me by Cat and the gloves I winged and did not do a good job on. Tights were purchased and I painted old white shoes to match the rest. Thoughts: I LOVED this cosplay! It was fun and we were a big hit! Unfortunately it is hard to see much unless there is a lot of light (which there usually wasn't) so we didn't always know when people were taking pictures or finished taking pictures unless someone told us. It was a little hard to hear. We had the King and other friends herd us around the hotel in a big linked chain, stopping occasionally for pictures. Also, it gets very hot inside those heads! But totally worth it! Even after spending about 10-11 hours painting all those circles (yes, 10-11 hours for the whole head and dress-just for circle painting, though I worked 12 hours total including putting the lining on the head and making the gloves) was worth it. Ending Notes: Wearing so much white at NDK was sort of rough. It is not the cleanest of places and it is hard to keep them white. I got some makeup on my Shuiichi costume and a little drop of chocolate on Yoko's tail (not sure how, but that's OK). 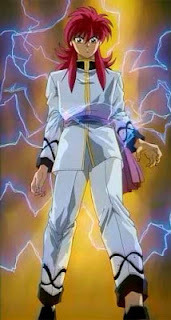 Something to keep in mind for the future and for those thinking about white costumes. 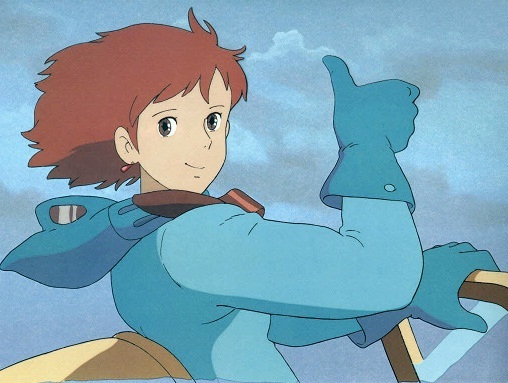 For next year we are talking about doing a large Ghibli cosplay! 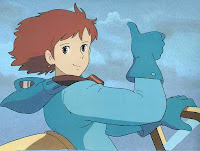 I hope this one pans out because I would love to be Nausicaa! Have to plan these things in advance you know!